Figure A19. Brasilia anomaly, interpreted as the Brasilia slab, with (horizontal) [vertical] cross sections through (A)[D] the UUP07 p-wave) and (B)[D] the combined SL2013 and S40RTS s-wave models at 1110 km; C) the location of the modern geological record that we interpret to have formed during the subduction of the slab. 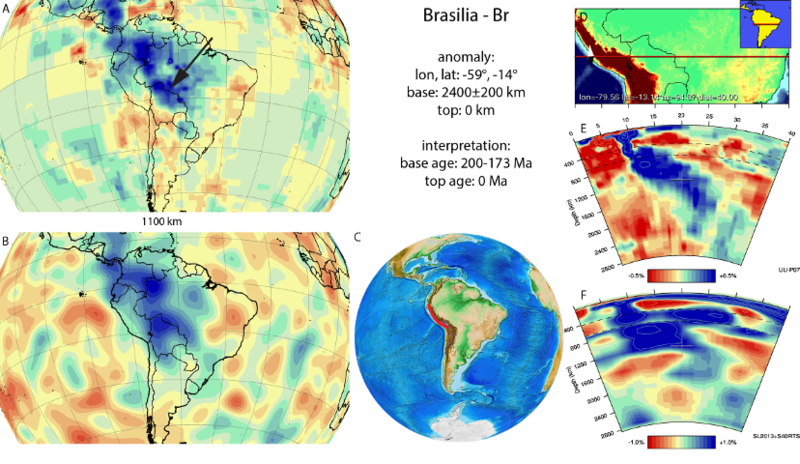 The Brasilia anomaly (Figure A19) is located below central South America from the deep lower mantle to the Andean trench. It is N-S to NW-SE trending. Above 1175 km it connects to other slabs of the Farallon family of anomalies, in particular the Venezuela slab and the Malpelo slab to the north. We interpret the anomaly as a slab that resulted from Mesozoic-Present Farallon-Nazca lithosphere subduction at the South American continental margin. The start of arc magmatism in Peru has been recently documented to have ages ranging from ~200 Ma (Demouy et al., 2012), 180-145 Ma (Villagomez et al., 2011) to 173 Ma (Boekhout et al., 2012), which we take as the minimum age range for the start of subduction. These studies find a gap in magmatism between 145-110 Ma (Villagomez et al., 2011; Boekhout et al., 2012; Demouy et al., 2012), followed by volcanism into the Cenozoic (Demouy et al., 2012; Jones et al., 2014). In the tomographic model UUP07 there is not a noticeable gap visible in the slab, however the anomaly considerably weakens at 2100 km. In S40RTS, the anomaly appears to have a slab window at some locations at 2200 km, but the anomaly appears to be otherwise contiguous in the south. We do not find evidence from the tomographic models to spatially separate a deeper Jurassic slab from a Cretaceous-Cenozoic slab and therefore treat the Brasilia slab as one single slab that subducted since at least 200-173 Ma. The SL2013 model does show a significant positive anomaly on top of the transition zone, up to 2000km east of the trench. Another flat-lying anomaly in the transition zone and shallow lower mantle is visible in the tomographic model of Li et al. (2008) and modelled by Faccenna et al. 2017. In their interpretation it has from subduction possibly as old as 100 Ma. These shallower anomalies are not expressed in the UU-P07 model and we therefore suggest that the tomographic imaging of these anomalies and subduction evolution at depth require further investigation.